The Asiatic Black Bear, also known as the Tibetan black bear or the Himalayan black bear, is a medium sized, sharp-clawed, black-colored bear with a distinctive white or cream “V” – shaped mark on its chest. It is a close relative of the American black bear with which it is thought to share a European common ancestor. It grows up to approximately 190 cm (6 1/2 ft) in length. Males weigh between 110 and 220 kg (240 to 440 lb). The Asiatic Black Bear has a wide distribution range spanning from the east to the west of the Asian continent. This bear can be found in the forests of hilly and mountainous areas in East Asia and South Asia, including southern Siberia and Far East in Russia. In Russia the Asiatic black bear shares its habitat with the larger and stronger brown bear. However, the smaller black bear has a good advantage over it’s competitor: it can climb trees. Asiatic black bear hunting is legal in Russia. 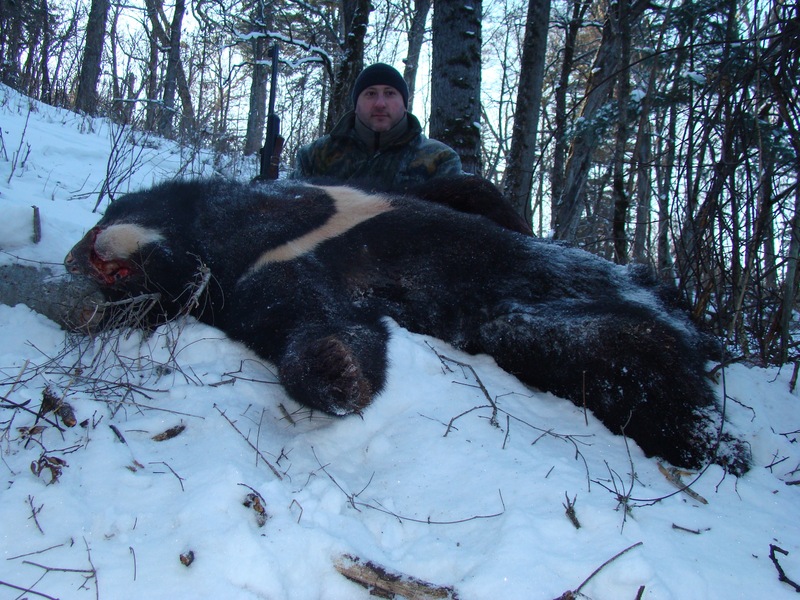 Sergei Shushunov and Russian Hunting Agency organize Black Bear hunting in Khabarovsk region and Primnorsky Krai by stalking and baiting in the fall or spring. Upon joining our mailing list, you will receive our DETAILED PRICE LIST. This list contains hunt description for each animal and destination, group sizes and a detailed cost breakdown, including accommodations, fees, permits and airfare. Copyright © 2019 Russian Hunting LLC. All Rights Reserved.